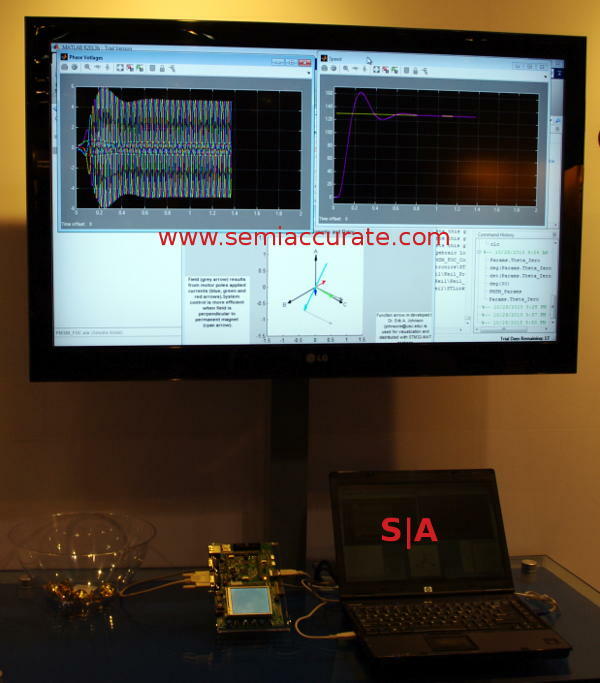 ST was showing off two neat tools for its STM32 family of controller boards, a Simulink based code generator and Java. Neither are going to change the world but both could make your life a lot easier if you are developing embedded code. The first one is pretty easy to explain but complex to code, very complex. If you take an embedded controller, ST recommends their STM32 family of products here for some reason, and want to control something with them, the code to do it right is surprisingly complex. The difference between a smooth operating device and something that stutters, jerks, and even breaks is mostly nuance. Can you describe the voltage curves over time to make a motor open and close something smoothly? If you can, ignore the rest of this article. For the rest of you ST has teamed up with Matlab to make a code generator for such things. You design your device and how it functions in Simulink and then it should spit out code that controls what you just dreamed up. In theory it saves you a lot of time doing the hard but surprisingly detailed math but SemiAccurate can’t comment on how it works in practice. That said even if this combo gets you some of the way there it sure beats a “Hello world” code demo as a starting point. Java on the other hand is a bit easier to explain. ST brought Java to the STM32 family with the help of IS2T. Sure it is Java Embedded, not the full version or the massive Java EE but it sure beats assembly for ease of use. Once again getting your project up and running is a heck of a lot easier in a high level language, the low-level work can be done in a more appropriate language or even Simulink should you take that route. If you are doing anything with a UI, it sure helps to have a full featured language with graphical libraries. Speaking of which…..
Now your dishwasher can have a GUI, progress right? The other half of the Java announcement is the porting of IS2T’s GUI Pack Widget Libraries to the STM32 line of devices. Want a pretty dial for the color touch screen on your upcoming uber-washing machine? This would make life a lot quicker and shorten the time to market quite a bit, if nothing else it sure beats having to code that stuff yourself. All you have to do now is convince yourself that appliances need fancy color UIs and touch screens instead of a few knobs, but that is not ST’s problem.